METHUEN, Mass. — An animal rescue farm in Massachusetts says it’s experiencing a goat overload — and it’s not kidding. 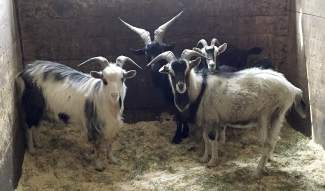 The MSPCA-Nevins Farm in Methuen recently received nearly 50 goats and is asking people to step forward and give them new homes. The goats are an assortment of alpine, pygmy and angora mixes. They were voluntarily turned over by an owner in Montague who couldn’t handle the growing herd. Some are nursing kids and pregnant does. Nevins Farm barn manager Gia Barss says people who want to adopt the goats should have experience raising them and be willing to adopt more than one because goats are highly social. Most of the goats tested positive for a bacteria that causes intestinal upset and parasitic infections, but they’re expected to recover.